Batman '66 launches. DC Comics does a retrospective of the highlights of '66 including "It's a Bird! It's a Plane! It's Superman!" which opened that year. Julee Antonellis and Petey Gibson of Boston's All the King's Men and The Gibson/Antonellis Comedy Hour named to AfterEllen's list of 50 Hot Women in Comedy. NYC Restaurant Week starts July 22nd. Save on dinner at a great restaurant before catching a play. More casting news on the upcoming musical version of Little Miss Sunshine. How you doin'? 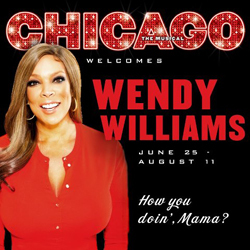 Wendy Williams makes her Chicago debut as the latest Mama Morton. Mad Men star Rich Sommer and castmates celebrate the opening of The Unavoidable Disappearance of Tom Durnin. Jan Maxwell talks about the joy of performing in rep.
Where to go for free outdoor theatre in New York City. Someone who doesn't really seem to like Broadway theatre nonetheless recommends seeing some shows. Willem Dafoe appears in the Manchester International Festival. Ellie Chamberlain Galidas dies. Founded Washington's Summer Shakespeare Festival. Actress Gia Carides stars in Beached, a black comedy about an obese teenager who goes on a reality TV show in return for free gastric bypass surgery. When I grow up, I want to be this lady. Profile of playwright Sharr White.